It can be difficult to think about yourself as an entity, or as something to market. When making the decision to build your personal brand, it’s important to focus on a few defined key points. Your personal brand is a clear expression of your own value proposition, and you should be able to articulate it as clearly as you would for your own company. Focus on how you bring and create value and find different ways to capitalize on that. I’ll discuss three of them below. The upside of every human not being a unique, special flower is that there are bound to be a ton of people out there like you, who are interested in the same things you are. Maybe they’re even interested in what you have to say on those topics. If you’re a great writer, try penning a post on a platform like LinkedIn that can help you gain notoriety (the good kind) among your professional peers. It’s supremely easy to post, and it surprises me that more marketers don’t take advantage. You see that “Write an article” button at the top of your LinkedIn homepage? Click it, and you’re sent right to an easy article posting page. It’s the morning of game seven of the World Series, and two of the longest droughts in Major League baseball history are hanging in the balance. Social media across the city of Jacksonville, Florida is lit up, talking about nothing but baseball. On the morning of the historic game that ended the Chicago Cubs 108-year drought, Jacksonville, Florida’s minor league baseball team swept in and stole the news cycle with a re-branding from the Jacksonville Suns, to the Jacksonville Jumbo Shrimp. For better or for worse, people flipped out. Whether it was praise or backlash, everyone was talking about a team that won’t have its first game for six months. Twitter went to work doing the marketing team’s job for them, even coming up with gold taglines like, “Shrimpin’ ain’t easy,” and promoting George Costanza to Assistant to the Traveling Secretary. Soon this was even garnering national news thanks to the uproar, with Fox News, NPR and Deadspin all writing pun-filled articles about the change and social media frenzy surrounding it. So what can we learn about branding initiatives from this minor league mayhem? Digital Marketing: What is a 21st century brand? Specifically, what is a brand in the 21st century, when we have the ability to converse directly with our customers? Brands are so much bigger than business, logos, names and locations. Brands go deeper, beneath the visible surface and exist in the mind. Brands are essentially perceptions and emotions. They are feelings and associations that come from interacting with a product or service. A brand in the 21st century exists in the feelings customers get when they interact with a company’s product. It is a direct reflection of that company’s culture, value proposition and the individual personalities of its executives and employees that help shape the brand’s core values. With the advent of social media, the cultural norms that dictate how a brand interacts with its customers have irrevocably changed the way we view it. Brands have become more human, and today’s technology allows us to have a real-time conversation with our customers as well as allowing them to start a real-time conversation with us. This means brands are quicker to respond to the praise and critiques of marketing campaigns. Recently, Starbucks had a social marketing campaign that focused on a desire to force its customers to talk about race. In the campaign, Starbucks had their employees write, “Race Together” on cups of joe. The idea was that every time someone got a cup of coffee, it could be an opportunity to talk about the recent racial and social tensions that have recently gained traction in the national media. After only a week of near constant criticism, it came to an end. However, it didn’t harm the Starbucks brand. In fact, it reinforced the brand’s values in the minds of the public. Because Starbucks has crafted a socially-conscious brand image, it has often been criticized by taking a stance on socially divisive subjects. However, for better or for worse, the company has taken a stance on social issues, which is the main fact perceived not only by customers but also the media at large. Failures have (so far) been forgiven. The hardest part of managing a brand in the 21st century is with all the avenues we have available to interact with customers, ensuring that messaging reflects brand values. Brands today can make jokes in social media, wish customers happy birthday and interact frequently with the online communities that support them. It is these communities in the end that help define the perception of the brand in the minds of other consumers. By developing relationships with them, brands can grow a brand image that will absorb the blows of bad campaigns and help gather steam to launch its next marketing idea. 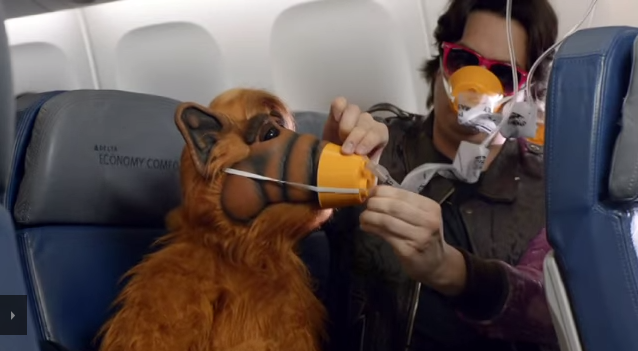 Since when did airline safety videos become so darn viral? What used to be a dry and boring legal formality has now become a way to engage audiences outside of the plane cabin. For those not so familiar with the world of J. R. R. Tolkien and Peter Jackson, New Zealand was the filming location for all three “Lord of the Rings” films as well as the more recent “Hobbit” movies. This isn’t the first time the airline has capitalized on the “Hobbit” hype for its in-flight safety videos. In 2012, they used the theme in coordination with the first “Hobbit” film in the series. However, Air New Zealand is not alone in taking safety videos to the next level. Delta has produced some pretty entertaining safety videos as well, notably this 80s-inspired throwback featuring big hair, crazy clothes and of course some iconic characters from the time. These safety videos, while still used for the in-flight safety precautions, were undoubtedly created to become viral online. What was once an untapped resource has become a way to kill two birds with one stone: comply with FAA regulations and entertain viewers. But even more than that, these videos are great content marketing. For Air New Zealand, the company is gaining more brand awareness from these videos because, let’s face it, most people will probably never make the 24-hour trek to the island. However, by embracing its ties to the “Lord of the Rings” franchise and getting creative, it’s found a way to reach audiences who may have never heard of the airline company before. For larger airlines like Delta, I would argue that having more entertaining safety videos is a way to spice up what used to be mundane travel for 165 million travelers each year. As a popular network, these videos add more personality to the brand. For me personally, I saw one of Delta’s comedic videos on a trip I took, and that video was the first thing I told my family about when I landed was that video. Even on the flight, people were chuckling and talking about the video, even if they had seen a similar one on a previous trip. Gilbert Gottfried was recently fired by Aflac because he brought disgrace to a talking duck. No small task. But the problem was, Gilbert Gottfried was thinking like a comedian, not a marketer. And perhaps Gottfried can be excused, because he’s not really a marketer. He’s been doing standup since he was 15. Job #1 for a comedian is to get the laugh. No matter how inappropriate the joke is, if it’s funny, it’s a success. Not so for marketers. Job #1 is to sell the product. If you can make a funny ad that sells the product, that’s great. If you can make a boring ad that sells the product, that’s great too. But, never, ever produce anything that alienates your customers. Perhaps the hardest day to successfully walk this tightrope is on April Fool’s Day. The year was 1996. Back then, the national debt was a pressing problem (you may have to strain a little to imagine a time like that). 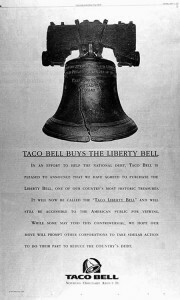 The Punchline: Taco Bell is buying the Liberty Bell to pitch in and help with the debt. 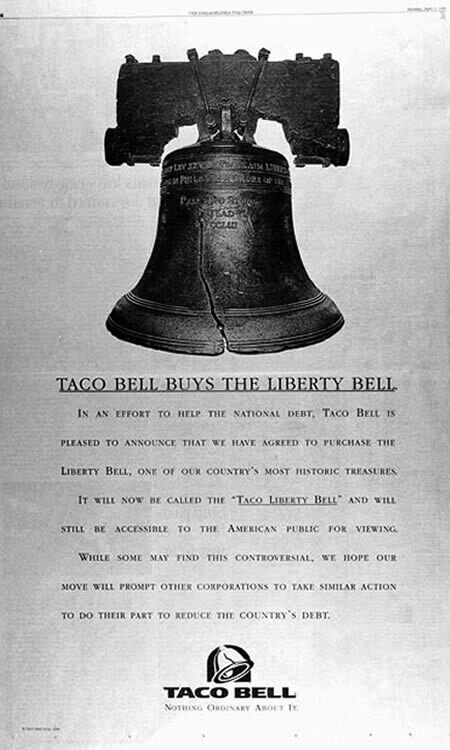 Thanks to this purchase, it will also be rename this national icon “Taco Liberty Bell” and display it in Taco Bell’s corporate headquarters (Historic sidenote: Since the Internet wasn’t as widely adopted back then, Taco Bell used something our forefathers called a “print ad” to communicate this hoax). Get it? Because… Taco Bell is at the forefront of groundbreaking marketing campaigns, and marketers will put their names on anything to turn a quick buck. Analysis: I included this classic example so we could compare this year’s efforts to what marketers were doing before all April Fool’s hoaxes were essentially carried out online. See, it was still possible. Also, because this was one of my all-time favorites. Probably because “Taco Liberty Bell” is just such a great line, and as a writer I’m a real sucker for great lines. (Writer’s sidenote: Supposedly, the sole reason Jerry Seinfeld made “Bee Movie” was because he loved the punny title). David Paine, Founder of PainePR, the public relations agency that executed the campaign, feels that the climate today is much more cautious and a comparable prank is not possible. Also, it’s harder to stick out with so many companies pulling April Fool’s Day pranks. It’s just become expected. So, let’s forget those impressive numbers for a second, and try to decipher the messaging. The underlying joke is that Taco Bell is a great marketer. But, is that really its value proposition? My guess is that Taco Bell’s value prop is more along the lines of – “cheap, fast food that’s not a burger.” And this marketing hoax doesn’t convey that idea at all. Of course, I could be wrong. Maybe Taco Bell would prefer customers focus on the marketing than what’s in the food. The Punchline: No longer are you confined to a mouse and keyboard, great inventions at the time. 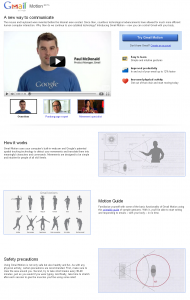 You can now improve productivity and increase physical activity by typing email with your body motions. Get it? Because… Google is coming out with so many new, free, cool beta products, you never know what they’re going to come out with next. Analysis: To me, this one is the flat out funniest. I love the main video. The deadpan guy dancing around to write his email messages not only cracked me up…but my daughter as well. Plus, I noticed one of our developers had the Motion Guide posted on his wall. If you can get a writer, a developer, and a 2nd grader, that is a pretty wide demo you’re appealing to. Overall, I think this prank ties very nicely into Google’s main value prop, which I would guess is “But we, somehow some way, keep coming up with funky cool technology like every single day.” And I think supporting the brand and the main value proposition is essential for everything a marketing department produces, even a prank. If I had to find fault, though, this perhaps draws some attention to the technological prowess of Google’s main competitors – Apple and Microsoft. After all, developing a product so you no longer have to use “outdated technologies like the keyboard and mouse” could also refer to touch screen technology, where Apple’s iOS and iPad seem to be beating Google’s Android touch screen operating system pretty handily. Also, what Google is treating as so difficult and science ”fictiony” as to be an outlandish joke is a reality for customers of Microsoft’s Kinect, “a controller-free gaming and entertainment experience,” in a quote that must have been written by a team of lawyers in Redmond. It’s actually a pretty cool-looking response to the Wii from Microsoft’s Xbox gaming system, a sensor device that picks up motion for a whole-body gaming experience. Of course, Kinect is just for games, right? Well, some hackers at USC gave Microsoft some nice press off of the Gmail Motion prank by combining Kinect with software they’ve developed to make what seemed ludicrous on April Fool’s Day a reality just a few days later. The Punchline: Can’t wait to walk to the next corner to get to a Starbucks? 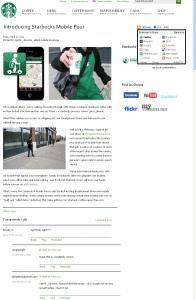 You can use a new smartphone app to have a barista on a scooter deliver your cup of coffee to you. Get it? Because… There is no spot on Earth that is more than 12 seconds away from a Starbucks location. We’re almost too convenient. Analysis: This ties in very nicely with Starbucks brands and reinforces the main value prop of “much cooler than the average cup of coffee and you can find us everywhere.” Plus, the underlying theme without saying it is…really, you’re getting your coffee at McDonald’s? Would their headquarter people even know what a smartphone is? Or a scooter? Or a decent cup of coffee? 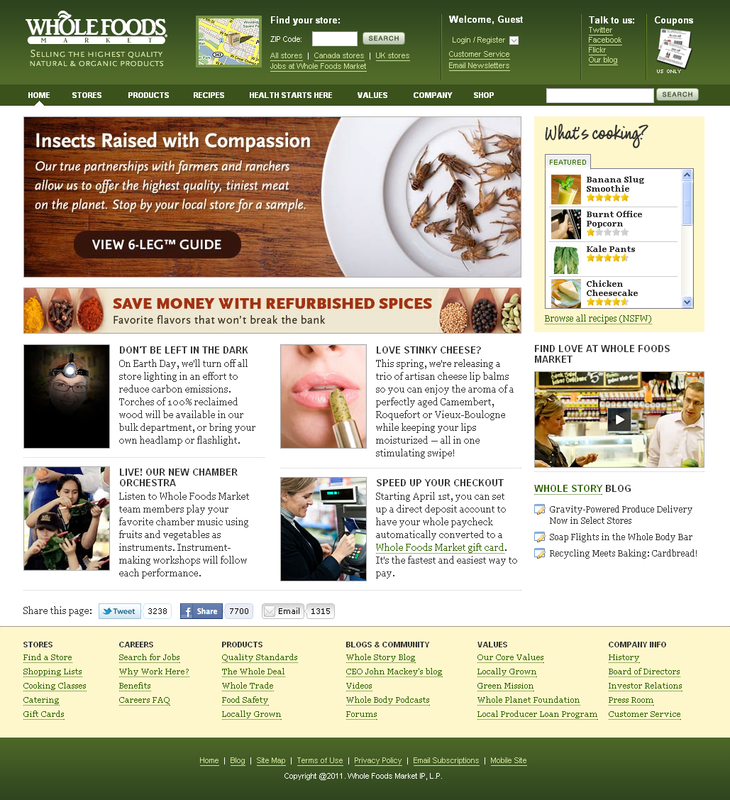 The Punchline: There’s not one main joke, just a fake Whole Foods Market homepage with headlines like “Insects Raised with Compassion,” “Save Money With Refurbished Spices,” turning the lights off in the store for Earth Day, etc. Get it? Because… I’m stumped. Best I could come up with is – You’re an idiot forpaying so much for our foods and your environmental leanings should be derided as well. Analysis: To me, this one is a huge fail. I’d say Whole Foods’ value prop is nicely stated right under the logo on their website “Selling the highest quality natural & organic products.” This prank totally undercuts the value prop…and the brand. I may be harsh because it cuts a little close to home. I shop at Whole Foods. I’m dead center in their target demographic. They make nice margins on food because their customers have deep-seated, eco-friendly values and are looking for healthier food than they could find in the supermarket. Also, occasionally, a little something special, more artisan than Kraft Mac & Cheese at a normal grocer. And yet, Whole Foods undercuts all of this. This April Fool’s Day prank mocks environmentalists by saying it will shut off all the lights in its store on Earth Day, so you better bring a flashlight or buy one of its “torches of 100% reclaimed wood.” This is clearly based on Earth Hour, a very serious attempt by the World Wildlife Fund to prod action on climate change. “Insects Raised with Compassion” belittles anyone who would buy more expensive meat because it was raised under more humane conditions. Refurbished spices with “favorite flavors that won’t break the bank” makes me think I might as well buy McCormick in a regular grocery store than fork over the extra bucks to Whole Foods. And the joke about artisan cheese lip balms…maybe artisan cheeses are ridiculous? Maybe I should just stick to the Publix deli? Look, I can take a joke. I’m not seriously offended. But, remember, the point of marketing is to push product, not to get people to laugh. If this was a standup comedian like Gilbert Gottfried, he could rightly say, “It’s funny. Get over yourself.” But Whole Foods’ job isn’t to be funny; it’s to sell expensive food. This marketing hoax does not do that. 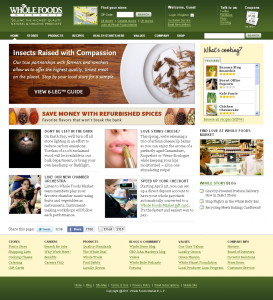 It undercuts the brand Whole Foods has worked so hard (and spent so much money) to build. It’s “The Simpsons” job to make fun of Whole Foods customers, not the Whole Foods marketing department. Laugh with your customers, never at them. Multichannel marketing strategies can be powerful sales and awareness drivers, but they can present challenges to maintaining consistent brand messaging and sales performance. Marketing through so many channels complicates achieving continuously improving results, says Dan Scott, CMO, Scott Kay. Scott’s team tests multichannel messages and materials in a small group of retailers and focus groups before releasing them in a broader market. If results are positive, the campaigns are broadened to 10 select markets. From there, the team may adjust the messaging in specific markets to improve resonance and response. “If in a six-month period the metrics are not performing as forecasted, then we’ll make additional changes,” Scott says. The team also uses a system of checks and balances to ensure marketing messages are consistent across channels. For example, the team requires Scott Kay’s retail partners to sign a compliance agreement before selling its products. Part of that agreement requires retailers to submit marketing campaign materials for Scott Kay’s approval. For example, one retailer wanted to invest heavily in marketing its Scott Kay collection in nearby movie theaters. Old Spice wrapped up a phenomenal viral marketing campaign this week that significantly leveraged social media channels, just as MarketingSherpa published our 2010 Viral and Social Marketing Hall of Fame. What started as a funny Super Bowl Ad featuring a spokesman with an over-the-top ego and a penchant for manly nonsense turned into millions of views on YouTube this winter. The agency behind the ad, Wieden+Kennedy, followed up with additional videos, but the effort didn’t stop there. For two days this week, the agency posted dozens of video responses to comments on Old Spice’s YouTube, Facebook and Twitter profiles. Every response is a unique, hilarious video of the Old Spice spokesman, actor Isaiah Mustafa, standing in a towel in front of a shower. The videos are steeped in the same humor as the initial ads — supplying dozens of additional videos to an audience that expressed a strong craving for them. They also gave the campaign an exciting, real-time creative edge by directly interacting with the audience and quickly churning out videos. Responding to these gatekeepers with personalized, high-profile and hilarious videos proved flattering enough to earn mentions in their respective media outlets. This brought the campaign to new audiences, further building the viral snowball. With such a stunning viral success, where does the campaign go from here? UPDATE 7/28: The campaign is proving to be a smashing success. Nielsen reports sales of Old Spice Body Wash increased 107% over the past month and 55% over the last three months, according to Brandweek. Anyone familiar with press releases sees it all the time: a bunch of words that don’t say anything. I’ve personally read releases with three or four sentences of real information. The rest was just superlatives and hype. Marketing strategist David Meerman Scott has targeted this type of writing since at least 2007, starting with his Gobbledygook Manifesto. In 2009, he pooled resources and queried journalists to pull together 325 common phrases. He then worked with Dow Jones to analyze their occurrences in over 700,000 North American press releases sent in 2008. At best, potential customers ignore such words, Scott says, and at worst they’re insulted by them. Furthermore, the words do nothing to differentiate a brand, and they’re unlikely to be used by someone in a search engine. They’re truly empty phrases. I recently interviewed Scott to ask him how social media can help cure a company’s addiction to these phrases (keep an eye on our Great Minds newsletter for the article). Scott shared a wealth of information — and not all of it made it into the final piece. Also, check if your content describes how your products solve your customers’ problems, and if it’s written in your customers’ language. Too many companies, Scott says, speak in a language that is only understood internally. For a good test, Scott suggests taking a block of questionable text, finding all references to your brands and products and replacing them with your competitors’ brands and product names. “If the language still sounds accurate, then you’re in deep trouble,” he says. You’re not differentiating yourself at all. A company blog can be a great way to build brand, credibility and site traffic–but blogging is often more work than first expected. And positive results rarely come quickly. The benefits gradually build as you toil through post after post. Also, there are blogs on topics from fruit to adhesives, and there are likely a couple that relate to your business. That means a new blog would have to compete. However, you don’t have to compete with blogs to enter the blogosphere, says Jay Krall, Internet Media Research Manager, Cision. If you’re thinking of starting a blog for business reasons, consider the opportunity costs of the time you’ll have to invest. Would that time be better invested elsewhere? You might get better, faster results (in the shorter term) by doing blogger outreach.